The piercing air is purifyng all the winter scenes in Japan. Cold it is but very beautiful. The leader of Sakura Mohila's village ladies, Kazal Rekha, sent me mail by the Messenger. She only wrote, "How are you???" It is the utmost of her expression, judging from her English level. But I can read between the lines(?) There is only one line and no between!!! Well, I can read what she really wants to tell me. She would to want to tell me, "How are you? When are you coming to Dhaka, because you told us to come in January. What day of January? Our work has almost done, but we are not very sure of the particular points. We need your attention to complete the work. Fatema got a baby, as you know she was expecting when you were wioth us. My daughter will graduate from high school in February. Is it OK if I take her to Dhaka? Give her good work. " Fatema might have a baby now. I tried to find it by asking some people, "Has Fatema had a baby now?" All the answers are the same, "Thank you"
I am not very sure of it, but I think I can read the answer through the pointless answers. Sakura Mohila ladies are quite natural. They follow the natural principle just as they live naturally. Women give birth naturally and bring the babies naturally, adoring and enjoying their growing. And strong wish of parents finds no edge to go into their growing. Fatema asked me in October, "Can I bring the baby here to Dhaka work place?" What did you ask?! You would come the long way by the super-local bus on the local village roads!" Unbelievable for me!!! But it is only a matter of granted for them. Sometimes their too much natural attitrude creats conflicts with the Japanese refined ways. It would take a long time to adjust the uneven points. I sometimes miss them very much, just because of their natural ways, after many years of togetherness. A man called an electrician to have his electrical system repaired. The electrician came up. Surprisingly, the electrician used to be his playmate in the childhood. They played together, they went to the same kindergarten, primary school and junior high school. When the work was done, they began sitting for tea, talking about whereabouts of their old mates. The topics were endless, after many years of no hearing. The bout of remembering and the information exchange of the old mates were over, the electriciak was about to leave, stil did not knowing to end the talking, the other began to put all the sweets on the plate between them in the palstic bag to give him, as he also could not want to say good-bye. The scene looked like when they were children and the mother used to do. The electrician looked simply happy and received the pack, simply happily. Both of them are respectable social members, and the cakes that are no special kinds, seem to mean nothing. But both of them looked very happy with the cake-giving -and-receiving. The simple human relation that was but both of them conducted very basic social activities to their heart' content. Jamdani weaving is one of the most valuable weaving in Bangladesh. It dates back around 3rd C, BC. The beauty of the cloth florished under the patronizing of the Mugal Dinasty. But it gradually became on decline: By the British colonization, the quality of the yarn got worse and the decline of the Mugal Dinasty. Now the cloth was revivied to show us flower fields on the cloth. 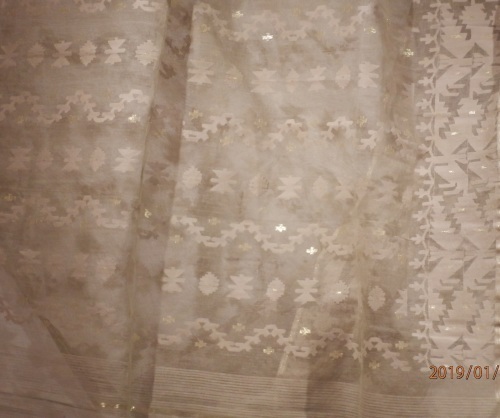 It requires great skill to weave, however the artisans cannot afford to earn good money, and less and less people are attracted to the art of jamdani weaving for their living. In persian language, "jam" means flower and "dani" means vase. 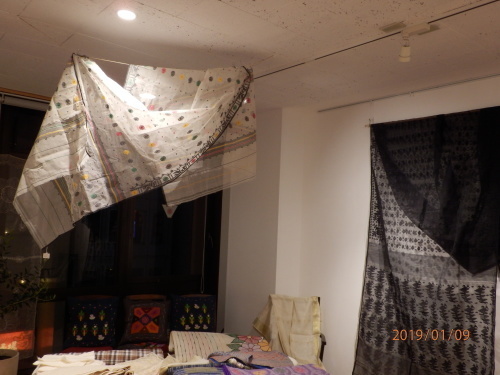 The beauty of the cloth is on display at Gallery Sakura Mohila. I hope you visit the gallery to see the old flowering beauty. The place is about 3 minutes' walk from JR Omiya station.